“You will face your greatest opposition when you are closest to your biggest miracle.” ― Shannon L. Alder. Well, what a weekend, perhaps enjoy this with some coffee, vino or a beer depending on the time of day you catch it. The weeks leading up were a little rough for me. I was beyond exhausted after my overload week in Placid. 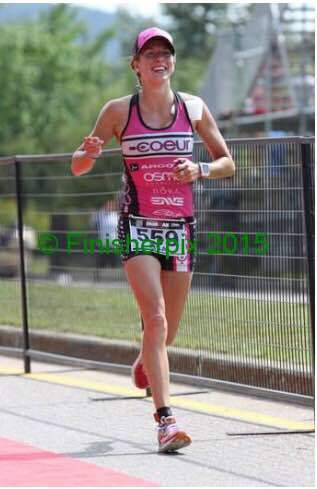 CLT went well but I was still extremely tired the following week and basically up until race morning in IMMT. We left Ithaca on Wednesday evening and spent some QT time with my mom and Pippin prior to continuing the trip up north. 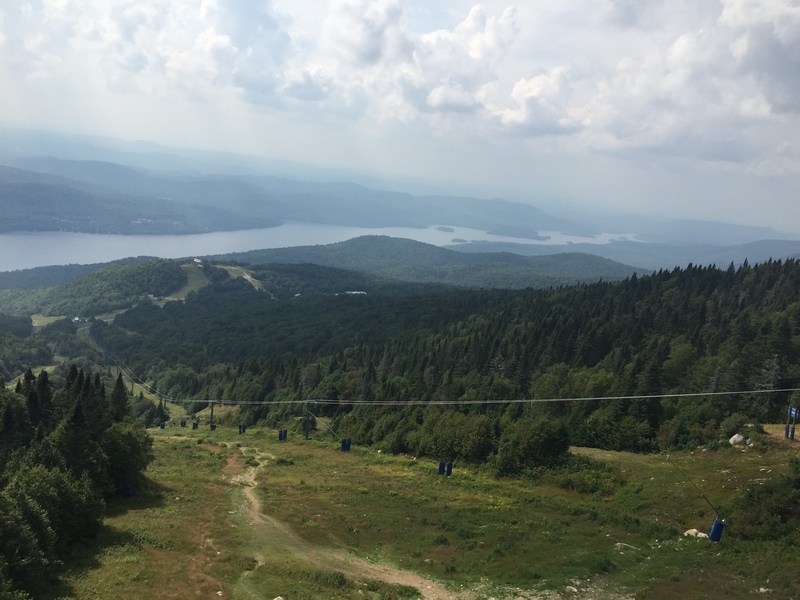 We (Doug and I both were racing), arrived in Mont-Tremblant on Thursday afternoon, after some crazy driving by yours truly to make sure we made packet pickup before 4PM (we did with 20 minutes to spare –score!). After we went to check in, unload, find dinner and someone still had to do a workout (not me). I decided I’d go find us dinner and walked into town from out condo. We also wanted to see how far of a walk it would be to transition etc. Fortunately it was only a 10-minute walk to the center of town. 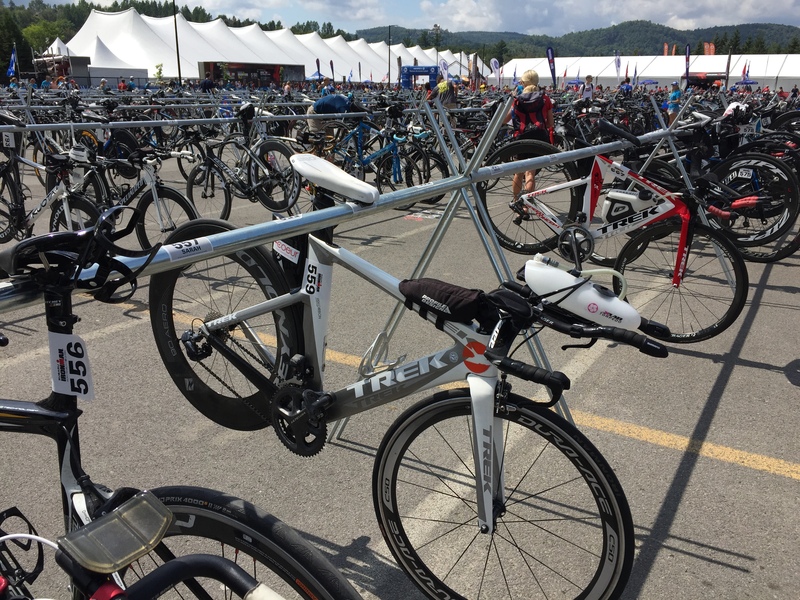 The resort part of Mont-Tremblant is very quaint and literally everything was Ironman ready. I finally found a little café that would work for dinner. After 3 attempts and help from a lovely lady from Boston I figured out how to use my fancy chip card (which was really nice actually since we didn’t have to get Canadian currency) and I was off back to the condo. Friday we woke up and went to swim in Lac-Tremblant. It was beautiful and a little cool after the rain we had the night before. Ultimately, I was looking forward to the swim and seeing the improvements I’ve made in the pool translate to racing. 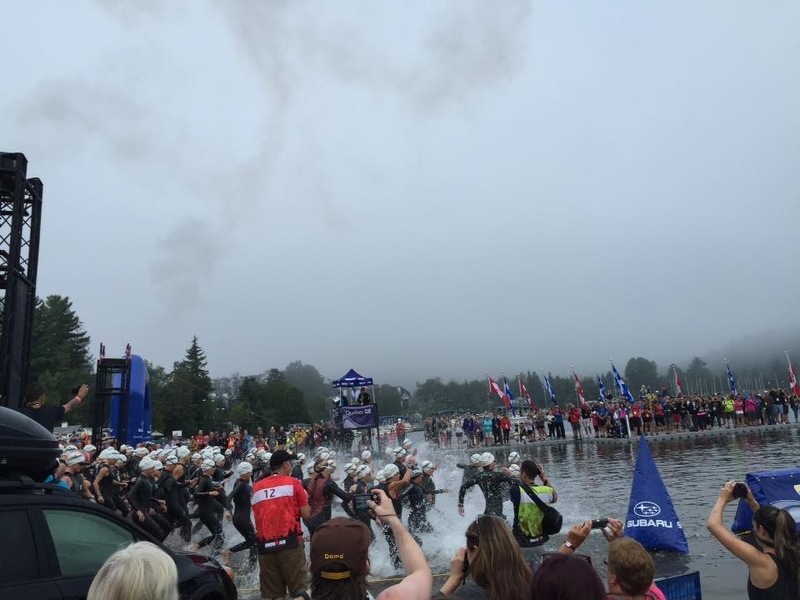 We heard there was a floating espresso bar (wicked cool) but we swam at the swim exit rather than the start. It was probably a good thing we didn’t see it as we both were off caffeine for the race and the temptation might have gotten the better of me. After swimming, we both jumped on our bikes and did our shakeout run. Once our workouts were done, I started getting my Transition/Special gear bags ready and we went to look at the bike course. Saturday consisted of the QT2 athlete breakfast for pancakes, dropping our transition bags and bikes off, and to just be lazy and relax. Dropped Timmy off the for the night! Sunday morning came quick and I slept well the night before which rarely happens. When the alarm went off, I quickly rolled out of bed to get moving and to enjoy the glorious cup of coffee I had been craving along with PB and banana toast. We left the condo by 5 AM and headed to check on our bikes and drop off our special gear bags. After Timmy was ready to go, I waited for Doug and we walked to the swim start. 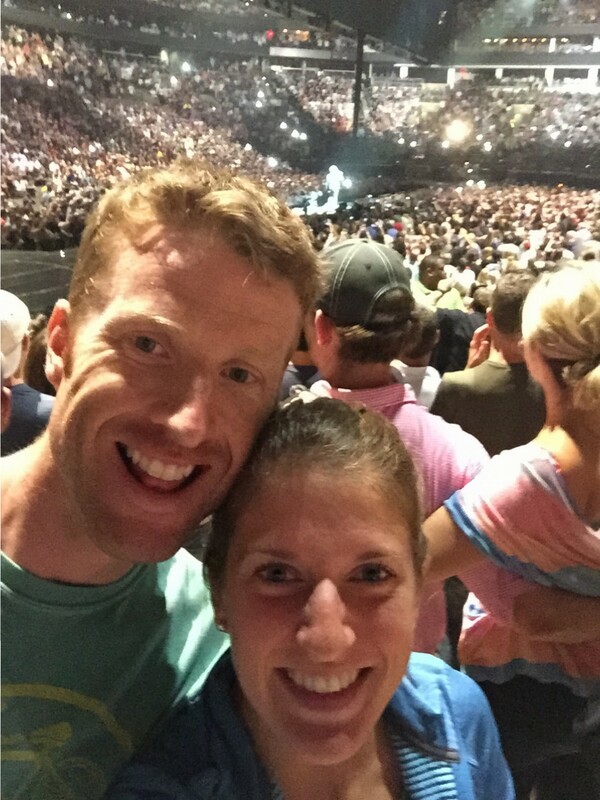 After I started waiting in the long porta potty line, Doug found me and told me to go to a different bathroom – there was NO line. Probably the only time in the history of bathroom lines that the men’s line was WAY longer than the women’s.. I’m talking shopping malls… the fair… you name it. Ladies you know what I’m talking about. 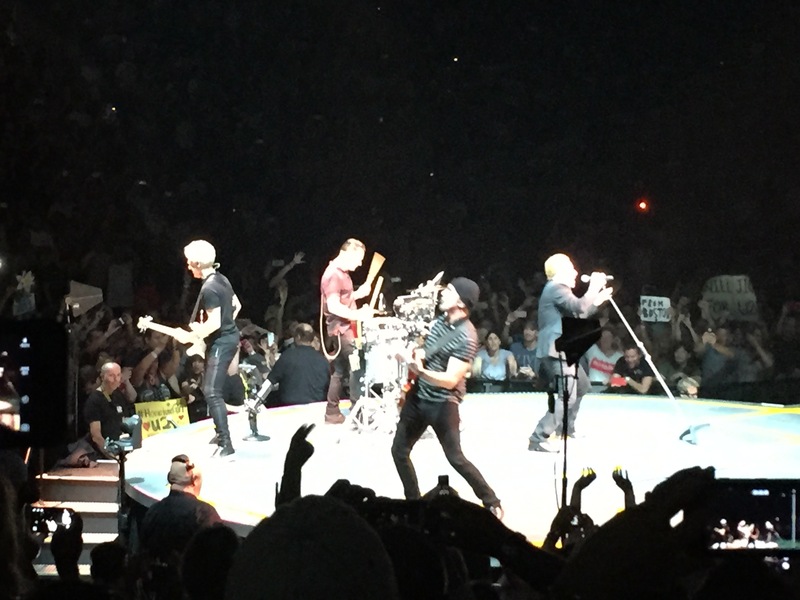 I was ecstatic – the men around me – not so much. After, Doug and I dropped off our morning clothes bag and headed to the beach. I had a while to wait before warming up but Doug was in the first wave, so he had to be efficient. After I said goodbye to him, waited for the Men’s Pro start, and Women’s Pro start before I did my warm up. I splashed around, reminding myself to reach, be tall and be smooth when entering the water. Not too long after, we were lining up for our wave. 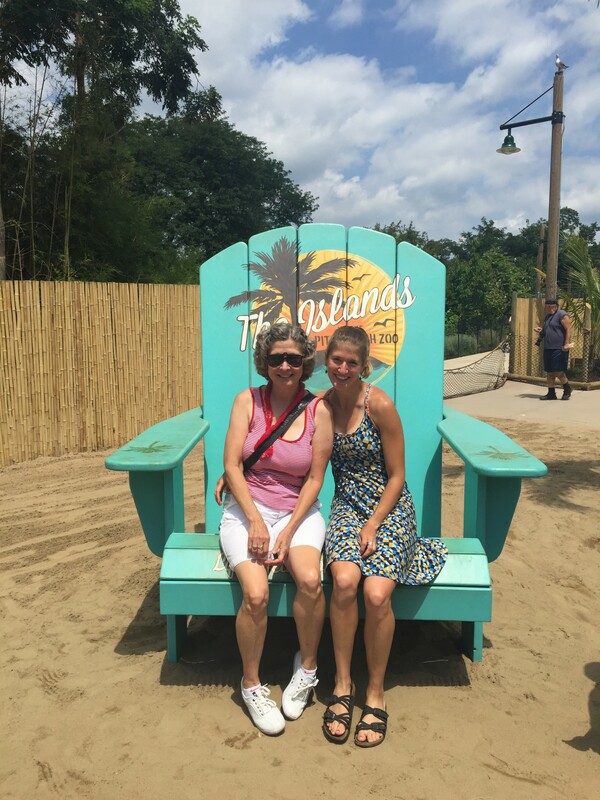 I wanted to make sure I had a moment to take it all in, the people, the noise, Mike Reilly, the fog on the lake, the buoy’s closest to the beach…. Before we knew it, we were on the water’s edge and the cannon and fireworks went off. I positioned myself in the second to third row back in hopes of getting on some feet and being aggressive in the swim. The start was surprisingly smooth. I didn’t have to fight, no one hit me or crawled over me. I was able to find feet relatively easy and before we knew it we were catching the men in the previous wave. IMMT is a one loop swim, swimming out was taking forever to get to the swim buoys, but I’m proud to report, I was focused the entire time. I’d keep checking in, if someone slowed down I found new feet. I swam solo for a little bit and another women in my wave was doing the same speed, so I dropped back and got on her feet. Finally we hit the turn buoys.. and I was happy. Way out in the middle of the lake, we had a little chop, but I was ready. After being in the chop at CLT and the practice swim starts at camp, this came from behind and to the side. I was surprised I wasn’t getting thrown around as much and did everything to stay on those feet. Finally I decided I wanted to keep my effort up and some of the faster swimmers from the wave behind us caught up. So I jumped on one girl’s feet and told myself “to not loose these feet.” I wanted to know what it was like to race a swim, and this didn’t disappoint. I remember thinking about how tired/crappy I was feeling but kept pushing on. Around 150-200M away from the swim excited I lost those feet and had to weave around all the people standing in the shallow water. I really questioned why they were walking so far out when swimming is easier and faster but I just stuck to my race. Finally I hit the beach and FELL. Yep.. talk about butter legs (My legs weren’t even tired). I heard my name and just kept running towards the wetsuit strippers – who were awesome. I couldn’t even get my wetsuit off my hands but before I knew it they ripped it down and then off my feet and I was on my way to the longest run to T1. I’m the black person falling to the floor. Oops. Looking back on my swim, I’m really happy, to AVG 1:43/100yd for me is insane. I never thought that was possible but needless to say, I was pretty excited. Also, I swam straight – I did sight a little to make sure I was on a) the right feet and b) to see the buoys. I was focused the whole time – it got a little long out there, but I was still focused. Never zoned out. Next time I think I need to be a little more confident in the start and find the faster feet earlier on. T1: Once in the transition tent, I quickly found my bag, got my shoes on, grabbed my sunglasses and helmet and ran to Timmy. It was kinda weird that no one was there to help. At Placid the volunteers in the tents were super helpful – one even put my shoes on, but I’m glad I had plenty of practice doing it all myself and not trying to rely on others! Bike: Once out on the bike I had to make sure that I calmed myself down. It’s a long way to bike and I know I wanted to just get going and ride but I needed to trust the race plan. Our goal was to AVG 144-145 for the entire ride and I did auto split every 28 miles to get a good idea. However my stomach was pretty nauseous – from the swim maybe? I just told myself that I had plenty of time for that to work itself out prior to the run. The bike course is pretty rolling but nothing too crazy. The part out on 117 got a little lonely, but I just focused on what I was doing. I was thinking of something Tim (Doug’s Coach) said at the breakfast – drink as much as possible until you have to pee. So I did, especially as I knew it was supposed to be hot on the bike but also for the run. I kept my focus on my HR, my nutition, my hydration and what the guys were doing all around me. It seriously felt like I was only surround by guys.. Granted there were only 2 female AG waves compared to 4 or 5 men’s waves. Oh well, people to ride with right? I was doing a pretty decent job of keeping up, even on the downhills! I actually hit a PR of 49mph going downhill. I saw Doug for the first time not too far down on 117. He looked like he was relaxed and having a decent ride so far. At the first turn around I checked my watch and saw that we were an hour in and I had hit 20 miles. I knew I’d have a good day at that point. After the turn around I started focusing on finding the women in front of me. 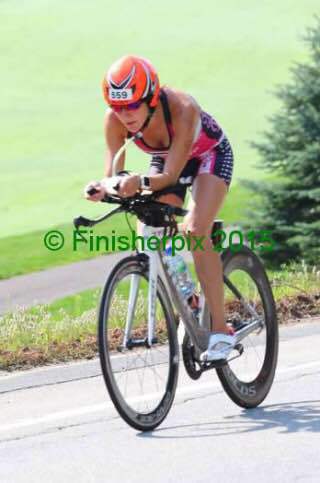 In addition to being focused fully on the swim, I feel I was focused the whole time on the bike. I thought of all the people I knew watching, tracking and those who had reached out and it just fueled the determination further. Once off 117, we had a baby turn around (which had a HUGE party at it) and back on the Monte Ryan towards Transition and Lac Tremblant. I really liked this part of the bike course – not sure why but it was fun, maybe it was the traffic circles that reminded me of the Tour De France. I also saw Doug for the second time! I made a mental goal of trying to see him once more on the bike. Once back near transition, we had another out and back – We had heard how hard this part was and drove it to see if it was as bad as people and mentioned.. Well, there were a few steep hills, but needless to say it wasn’t that bad. 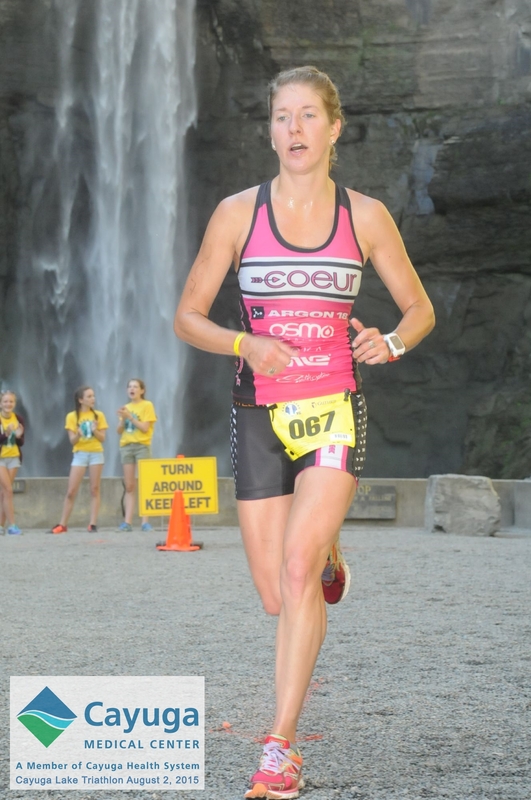 I focused on what I could control, my cadence and being as relaxed as possible. I had a HR cap for the hills on the course, but that kind of left otherwise I wouldn’t have made it up the hills. Once back at the turnaround I knew there wasn’t much distance left before hitting the turn around for the second loop. I felt like we literally flew back into town from the turn around. Checked the watch and knew if I didn’t blow up I was going to have a FAST day on the bike. The second loop was also pretty uneventful – the men were drafting like crazy, and every Penalty Tent I rode by was full of mostly men from drafting. I did see Doug again – I was a little distracted by the fellow in front of me – he had the SAME bike and color scheme as Timmy, but his rear derailleur was acting really funny, jumping gears. Heading back out to the turn around on 117 it was a little windier but not bad. After the turn around, it got a little hot, especially on the uphills – not sure if I ever sweat that much outside riding but it just reaffirmed to keep drinking. Before I knew it we had less than 20km to go and it was back to the slightly hilly part near the casino. At this point I just rode, didn’t worry about HR, tried to get more fluids down and just wanted to get back to transition. I was having a great bike and didn’t necessarily want to get off, but I was ready to see what the run would bring me. At the final turn around – there was a loud noise on my bike. The volunteers were great and told me I was fine, but I was freaking out a little. A fellow who had been riding back and forth with me asked if I was ok. When I said I was, and that my gears were working, he told me he thought I just took the turn too sharp and my peddle hit the ground. With his reassurance I felt better (and that Timmy wasn’t acting funny). After he told me to go get it and finish this thing up strong. So we all flew back into town. Back at transition I beat the guys off the bike and headed to the change tent. 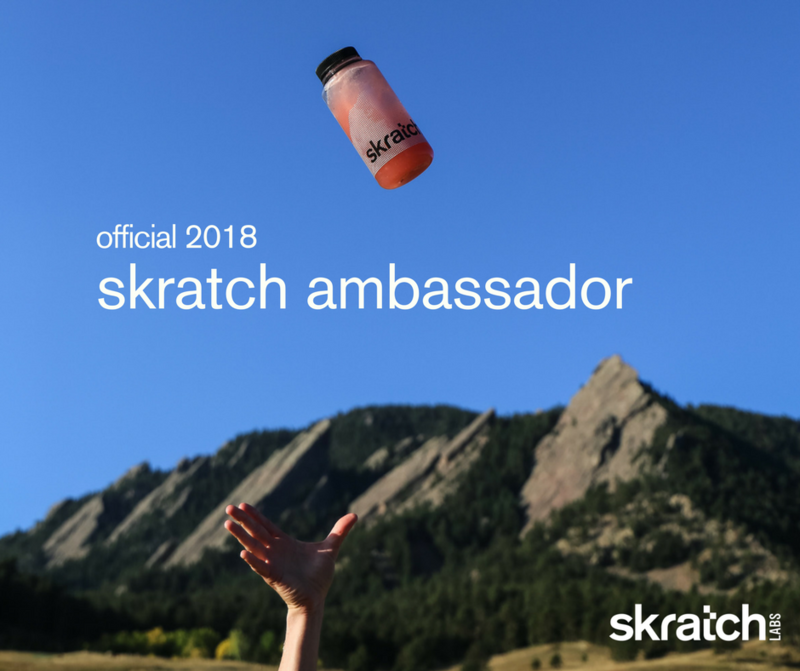 I was able to get 10 bottles of fluid down – Thanks Osmo! I also got 4 or 5 salt capsules down and ate all of my nutrition (5 sleeves of Shot Bloks -Tropical & Black Cherry- and 1 pounch of Honey Stinger Chews). The bathroom? I had baby waterfall like dribbles – I can’t figure out for the life of me why I haven’t been able to go to the bathoom on the bike this year. It’s been bothering me. Needless to say, with 10 bottles of fluid – I HAD TO PEE for the entire bike ride, but I refused to stop drinking. T2: Once in T2 I was getting all my stuff on again solo. However a volunteer did ask if I wanted sunscreen on. Needless to say, thinking of Doug, I told her yes. Before I knew it I was on my way out and saw the line of porta johns. THANK GOD. It was the most liberating pee of my life. I felt like I was in there forever but was fully hydrated. Run: Back on the red carpet and leaving T2 I happened to look up and guess who I saw – DOUG! It was almost finished with his first loop! It was a nice surprise. After it was time to get to business. 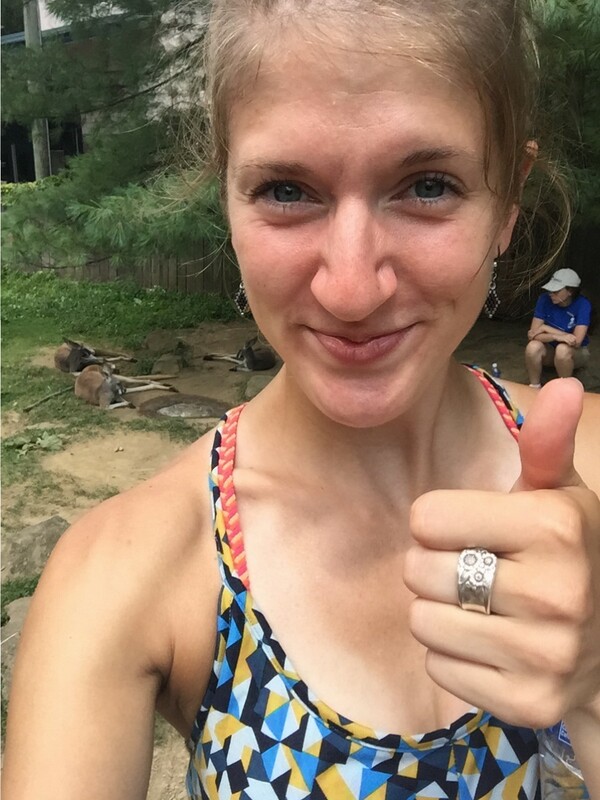 Knowing where I was after a PR swim and bike, I knew I just had to hold it together for the run and I was going to hit my (personally hidden) goals for this Ironman. Leaving the village, I was told to take the first mile out in 8:00min pace and then hold 156 HR for the run. Running up the first big and steep hill I saw Jennie and Dave and it just put a big smile on my face. I was happy to be running. I nailed the first mile 7:59 – but then things started to change. My stomach started KILLING me and I was nauseous again. Like the worst menstrual cramps (sorry guys) kind of pain and I got nervous. Was I going to be able to finish? How could I run a marathon like this? Was this normal? This is my best part of the race.. it couldn’t end this way.. Knowing Doug was coming back and thinking of what he told me – I started to take salt, but realized I didn’t know how often. Being the runner and not using it – I thought once a mile was a lot. Next we hit the out and back on the bike path – Thankfully Tim and Kristin were there and Tim told me to slow way down. Good thing he couldn’t see my face because I’m pretty sure my eyes bugged out – I was already running 10 min pace, how was I supposed to go slower. But – shuffled on through, taking Gatorade at the aid stations because that was all I wanted, ice down my top and water on my neck. Finally Doug caught back up to me and I told him how I felt. He told me to start taking salt every 3 minutes. So I did, and I told myself now it was all about survival. I just wanted to finish – even if I had to walk the whole freaking marathon. Finally I started feeling better – or at least the stomach pain was manageable and I could start running – like actual running rather than just shuffling. I still kept the Gatorade – ice – water at each aid station and really felt strong again. I was feeling really good about the day and kept chugging along. I passed all of the women that passed me in the beginning and I hurt for them (they looked like they were in pain). I saw Tim and Kristin again and told them the good news, before I knew it I was heading back to town. At one point the run splits – heading back into town you head down a bike path away from the road where others are running out. It’s a pretty steep downhill but it was one of my favorite parts of the run course. I managed to keep eyes level and was able to notice the view of the mountain – it was breathtaking. Back to town I recognized one of the girls in my age group from the morning body marking – a volunteer joked about us being competitive. I gave her a good job and kept going. At this point (after the first 2 miles) I was too nervous to eat anything so I skipped special needs and kept my salt – Gatorade – water and ice going. This is where I saw none other than Brendan! What a pleasant surprise! He ran alongside of me and gave some great encouragement. The next part is another favorite part of the course – you weave through the shops, on the cobblestones down through lines of people before you head back out to loop 2 or the finish. This is where I was tested again.. I really didn’t want to head back out but I reminded myself what I tell my athletes – moving forward and shuffling is better than walking, and walking is better than quitting. That stayed with me for the second loop on the run. As I headed back out along the lake (knowing Doug was done) my legs were hurting like they had never hurt before. 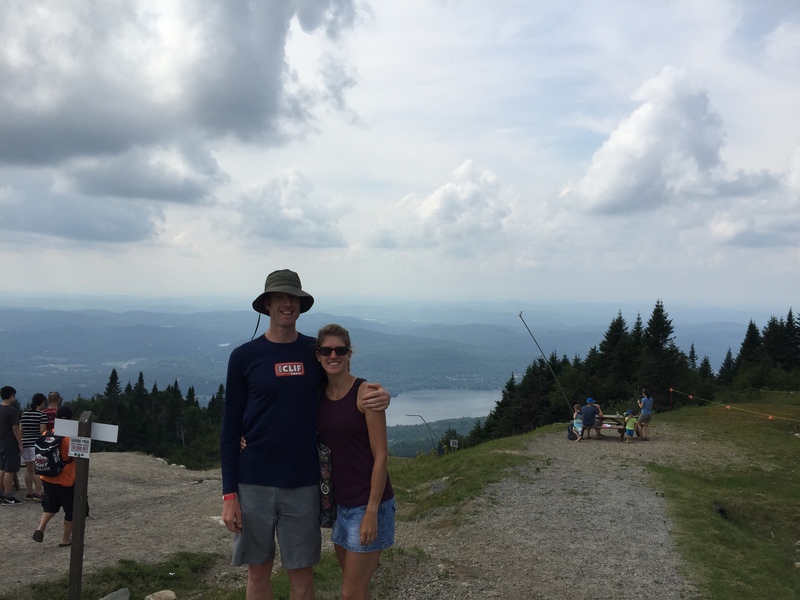 Not lactic acid – I’m decent with managing that – and I was running a marathon, but the aching was like nothing I had ever felt. Again, we went back into survival mode (we being my, myself and I). I checked my watch for my race time as well as where I was in the run and started crunching numbers. I could still have a huge PR. The hardest part was running back out on the bike path – it was so quiet and knowing that it’s the farthest point I just wanted it to be over. Once I reached that point I knew I’d be ok. I knew signing up for my second ironman it would hurt. I wanted it to hurt. I had big goals and I knew I could hit them. 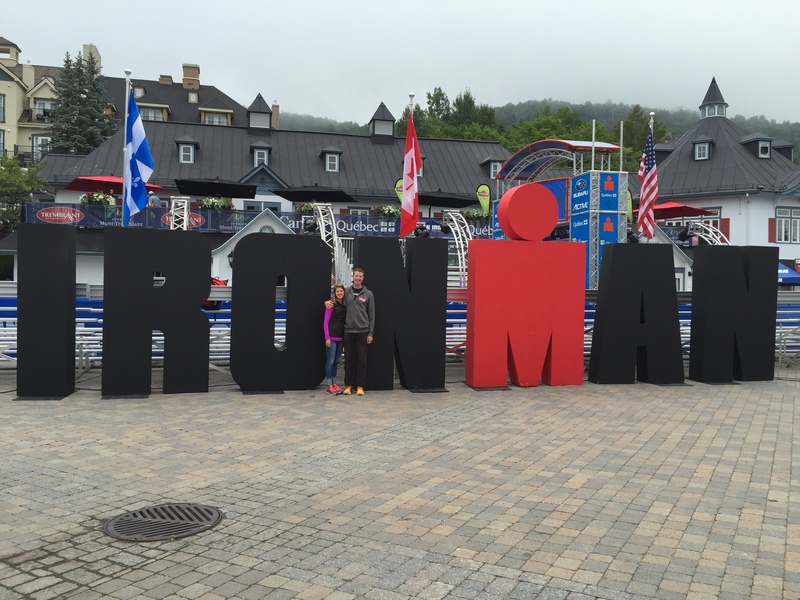 I didn’t want to just do an ironman – I wanted to RACE an ironman. In my mind there’s a difference. There’s absolutely nothing wrong with either of those ironman scenarios – last year I did an Ironman – it hurt, but I finished being able to stand, I was able to walk around normal afterwards. This ironman was going to be a different story and I wanted it that way. When I hit 10k to go, I wanted to make it hurt more. 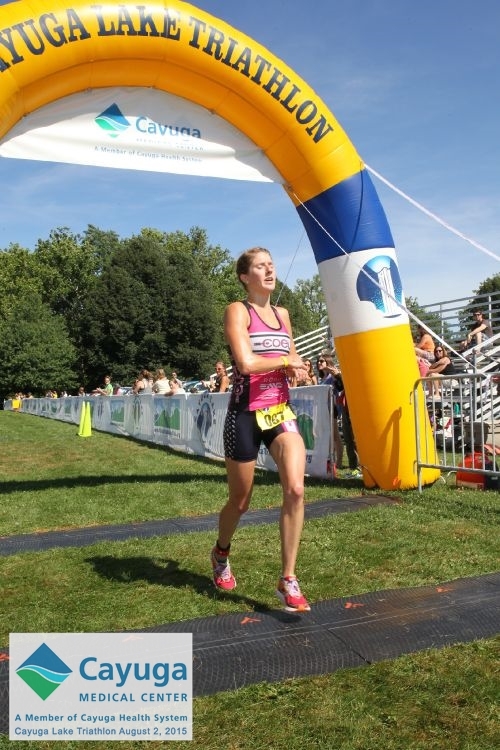 Being the runner – I started pumping my arms. It was only 6 more miles – it’s not like things could get any worse, my legs already hurt so much but moving them faster didn’t make it hurt any more. So I went with it and watched waited for the kilometers to tick on by. Heading back towards the village, I embraced the beautiful scenery, the pain, the ice, the Gatorade and the water. Hitting the last steep hill in town before the crowds carry you in hurt a lot – but thankful for the cheers, bravos, and congrats. Ran by special needs again and definitely didn’t want anything. Then it was the best part. The crowds were louder the second time when you reach the shops, restaurants and the lines of people. It was just a downhill until Mike Reilly and the finish line. The crowds were incredible – I was overcome with emotion, I tried to fight back the tears (which happened 4 times on the run..). Before I knew it, I was running up the ramp (which I was praying I wouldn’t trip or my quads wouldn’t give out – remember the swim finish?) and it was over. Doug was waiting for me and the volunteer was amazing to make sure I was ok. I made it, 11:14 – a 58 minute PR from last year. After I just wanted to sit, Doug got me watermelon, sprite, beer, and POUTINE (yes there was a food truck in the finishers tent with it). We chatted with each other (mostly about how terrible I felt on the run and not getting any food in on the 4 hour marathon), as well as chatting with some of the other finishers. I was really anxious to see where I was overall but we had no way of knowing being in a different country. Honestly at that point knowing my overall time, I knew typically that gets top 5. It was a little heartbreaking that I was 8th – but the AG was really competitive and the fact that I had finished was enough at that point. 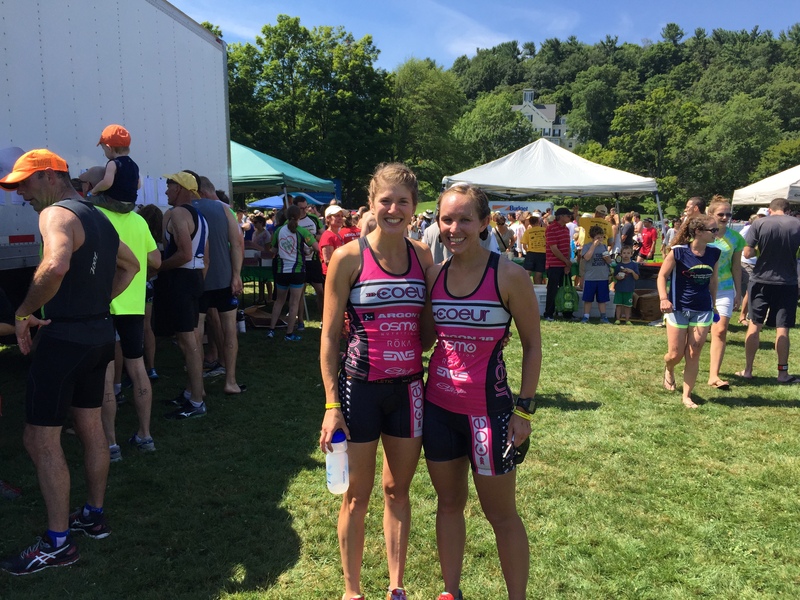 Kaitlin – the girl from the AM in my age group finished a few minutes later and we both congratulated each other. Side note: I learned later that we shared the Podium at Musselman and we have a mutual friend in Ithaca – I love this community, she’s doing Wineglass so hopefully we can meet up! Eventually I started to get cold and so somehow Doug and I managed to get all of our gear and our bikes back up the hill to our condo. After a shower, and some relaxing we headed back into town to cheer on the other finishers, unfortunately we both felt nauseous again (Doug had similar stomach issues as me on the run) and headed back to the condo for the night. The amount of soreness I accumulated those hours was unlike anything I had ever felt – but somehow I slept like a rock (even with the insane amount of caffeine I used). 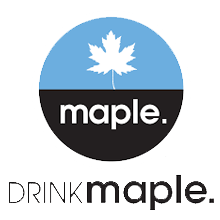 After the race, we ate poutine, a beaver tail, coffee, tea, poutine again, and had some delicious drinks (a few drinks). We walked around town, looked at the shops, rode the gondola, and just relaxed. It was the perfect ending to our time in Mont-Tremblant. My soreness you ask – well as I’m writing this in the car on our way back to the states – it’s the first day I can walk normal and even jog a bit despite still having incredibly sore quads… no laughing spectators! A big thanks goes to an entire village of people – these words don’t do justice. Doug for dealing with me, race week and every week, my mom for her unconditional support and encouragement (as well as the rest of my family), my friends and support crew in Ithaca for the constant encouragement, my athletes for completely understanding that I wouldn’t be available all the time and tracking my moves from afar, Coeur Sports for giving me a chance after my first triathlon, always reminding me the little things matter, and for keeping me comfortable during races and in training, Sarah, my chiropractor, for keeping my healthy and letting me destroy myself over and over, my Coeur teammates for inspiring and supporting me – A shout out to Meghan who has now completed both ironman (A big congrats for her PR Sunday too) with me and has given me the in race support to keep me going and everyone else who kept me on their mind, sent messages and gave my the ability to dream. This quote’s meaning goes beyond the words. 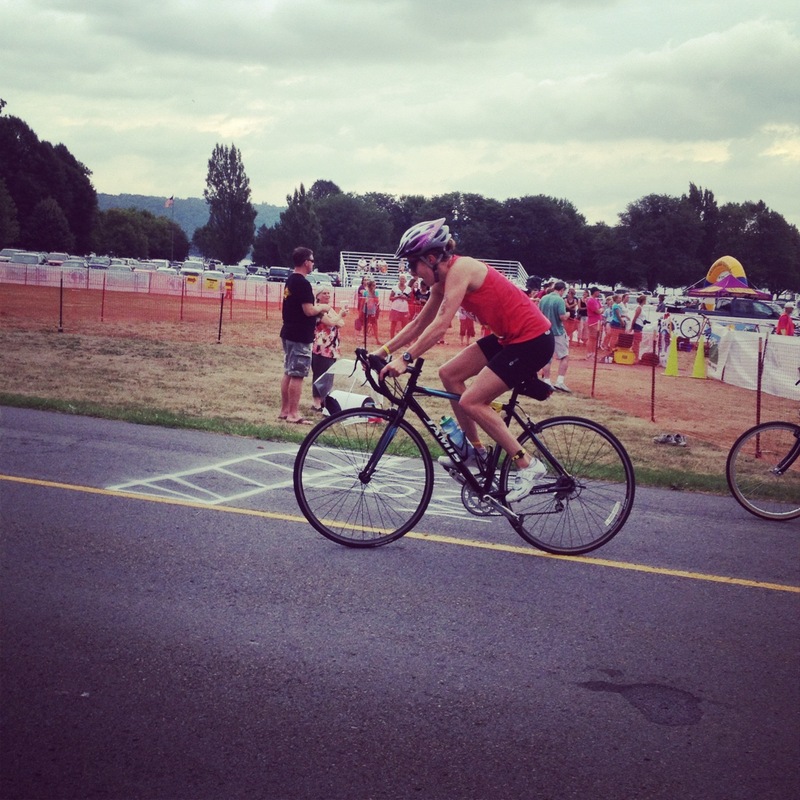 Sunday I raced a Sprint Triathlon (the Cayuga Lake Triathlon). This race means so much to me, not just because it’s local, but because the other athletes, volunteers, community etc all come together and are unbelievably supportive. It’s an atmosphere like no other. I highly recommend it. It was also the first triathlon I did 3 years ago. 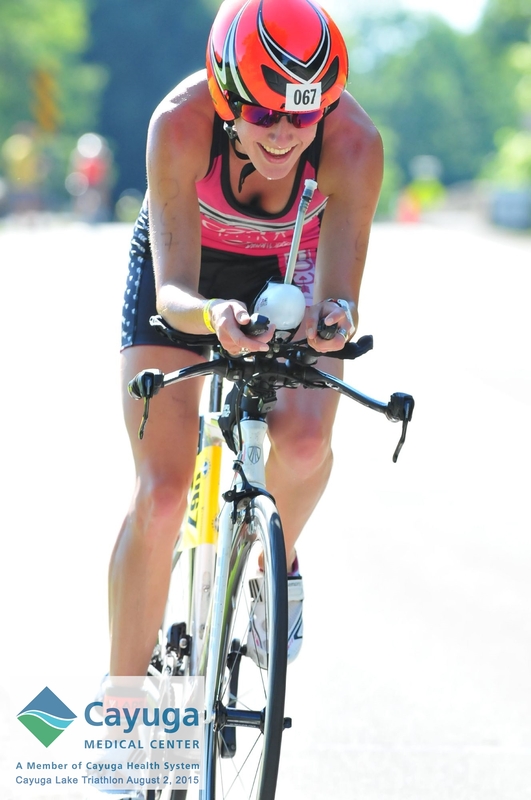 The Cayuga Lake Sprint Triathlon first came on my radar as I work at a local run/tri shop here in Ithaca. Ultimately, after getting my 3rd tibial stress fracture I wanted to do something during the summer, and was encouraged to sign up. Unbeknownst to me it would clearly impact me in ways I never thought possible. The race you ask? 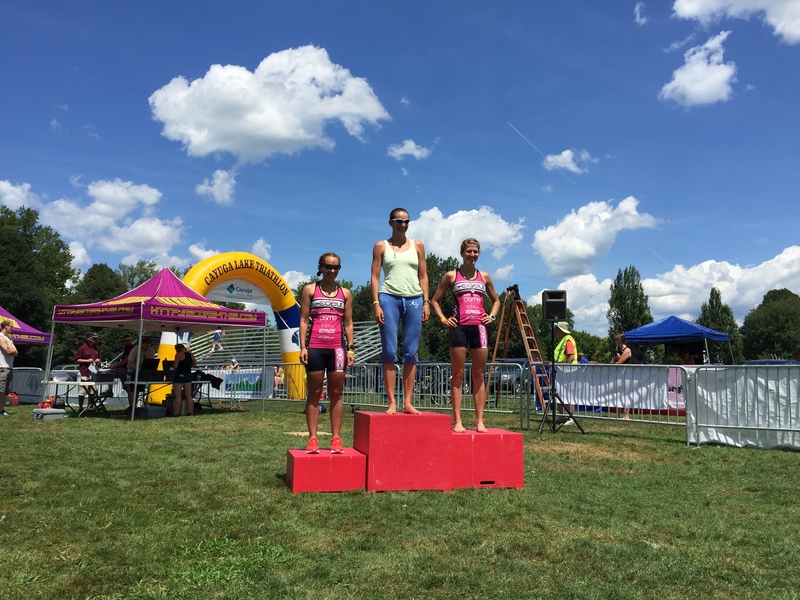 I was 3rd in my AG, I did the swim by breaststroke, my only goal for the bike was to not fall on my face when I clipped/unclipped my pedals (I didn’t), and I just wanted to run fast. Needless to say I finished in 1:31:30, which I thought wasn’t to shabby. This year was a little different. 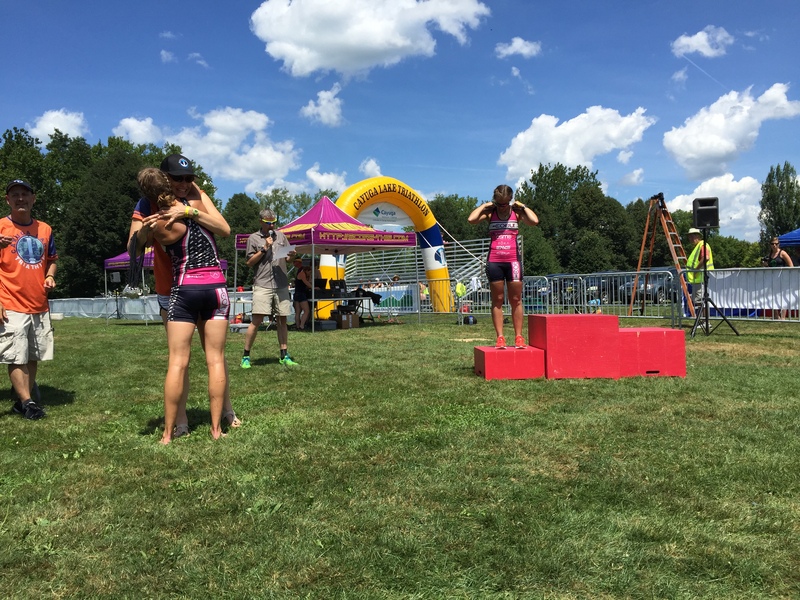 I knew I wanted to do CLT again because the atmosphere, most of the Ithaca tri community does the race, but it’s also a fun, relaxed, amazing event. Coming off my big build for IMMT I wasn’t too sure what to expect, but I was going to give it my all. Pre Race: Easy peasy, woke up, ate and we were on our way. Transition was set up quickly and before I knew it I was relaxed, bumping into friends, catching up with my mom and just waiting for the sprint waves to start. I cheered Doug on (he was in the first wave) and did a little warm up and just waited some more. Swim – 750M – 16:32 (actual swim w/o run to transition). I was really looking forward to this swim. 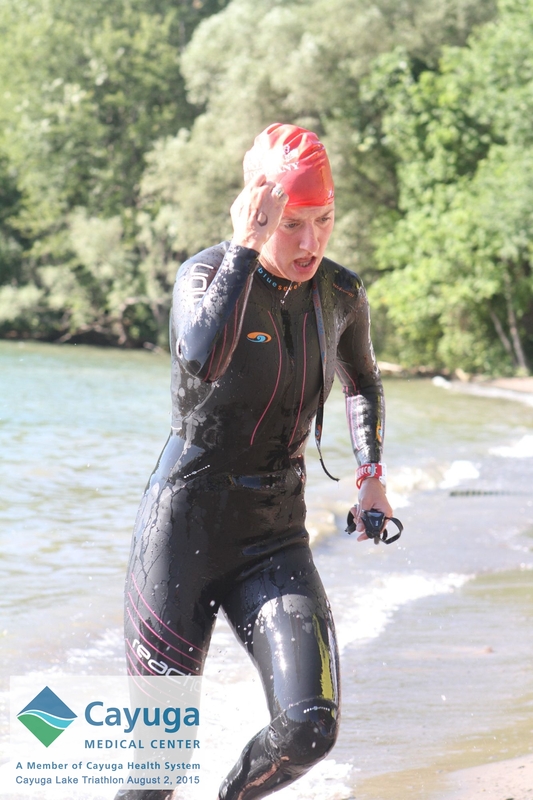 I wasn’t nervous at all and was pretty excited to swim in the open water (sometimes I still get anxious). Before I knew it we were able to go into the corral and waited to go down to the water. At this point, the waves were a LOT stronger and bigger than when Doug went off, but for some reason it didn’t bother me, until we started. Once led to the water, waited a little more and really felt the power of the waves. Before I knew it the horn blew and I just tried to get out hard, like we practiced at camp. Reminded myself that the only race goal was to ask myself if I could go harder, if I could I needed to go harder. Unfortunately, about halfway to the turn around, I was having trouble breathing and was utterly exhausted. I had to slow myself down and focus on getting O2 in. Started a little side stroke to calm the breathing down (definitely frustrated by that), tried to swim again, failed, side stroke again. I followed this until the turn around – thinking thank gosh I chose the sprint – then I really got into a good rhythm on the way back. I just kept pushing myself harder as I felt I had to really make up a lot of time. The swim on the way back went FAST. I kinda liked it! Finally I hit the beach and just moved to transition. I just wanted to get moving on the bike. Bike – 14mi – 40:36. I was SO happy to be on my bike. I love biking along the lake and have done this many many times. Once you leave transition you cross a bridge and climb for a while (like 3 miles?) and I just pushed, HARD. My legs were tired and cranky but I just kept fighting. I started to feel it but had some vocal encouragement to keep me honest just when I needed it (Thanks Joe!!). Once up and close to the turn around I kept note of who was in front of me. After the turn around my legs start yelling more, but Doug told me to go ‘all out’ and so I was going too. I prayed my legs would be there when I got off the bike. I felt like I flew downhill back to transition and was sad to get off Timmy. I really wanted to keep riding! Run – 5k – 20:58. Praying my legs would move, I was off. As I left I saw Doug run into the finish chute winning the race, which was fun. I kept moving as much as I could. My legs were not happy with me but hey – it was only 3 miles. Passed the first mile marker and used my mantra from the marathon – you can do anything for 15 minutes – and kept moving. I love this part of the race, you take the trail from the main part of the park and head to the turn around at the base of the falls. It’s shaded, cool, and absolutely beautiful! Who CAN’T smile at that view. Before I knew it I was turning back around. Pushing myself, rather nauseous at this point (probably because I drank half the lake) but I just wanted to get back to transition and the finish line. Running back from the falls was fun because I was able to see so many friends! Before I knew it, I was back headed toward the finish line and was done! All I could think about was how SHORT it felt. Now it was time to wait and see how the other waves would go. I ended up getting finishing 2nd overall and joined the top three women in being in top 10 of the Race. Definitely cool in my book! 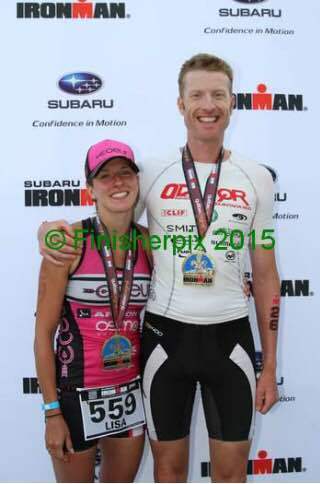 Also my Coeur teammate Jenelle was 3rd overall, it was awesome to share the podium with her! Two of my wonderful athletes! 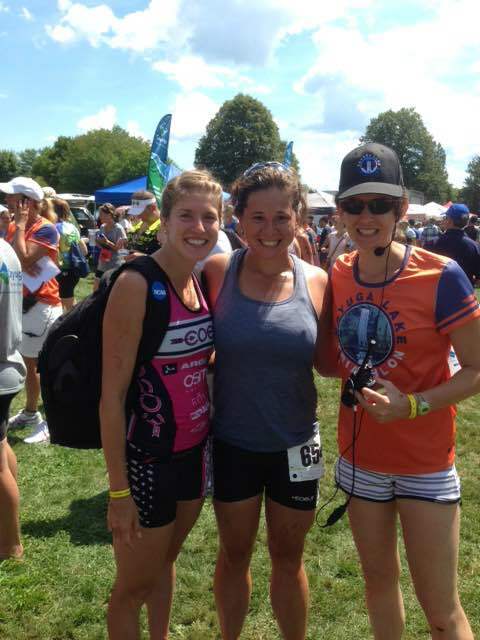 Alex (Left) the wonderful Race director and Dana (Middle) who fought through some bike issues and still PR’ed! Now, time to make sure I’m dotting my i’s and crossing my t’s. Some race specific stuff this week and then heading on up to IMMT! The countdown is on with T-12 days to go! A big shoutout to all my friends and family for their constant and consistent support and encouragement, I couldn’t do this without all of you! 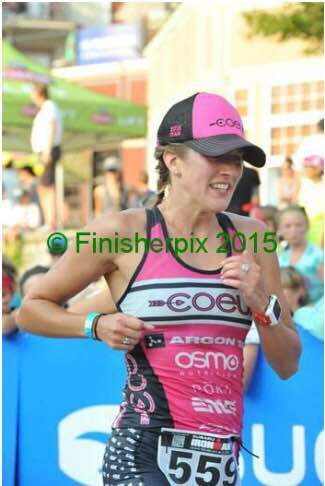 ❤ Also a big shoutout to Coeur Sports, Oiselle, Osmo Nutrition, My Chiro, Sarah and of course the Finger Lakes Running and Tri co! 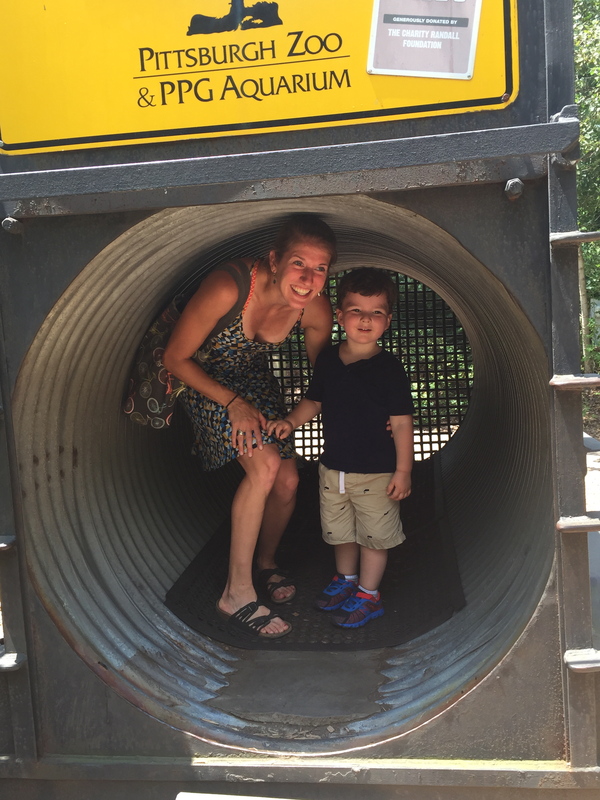 Fun at the Pittsburgh Zoo!